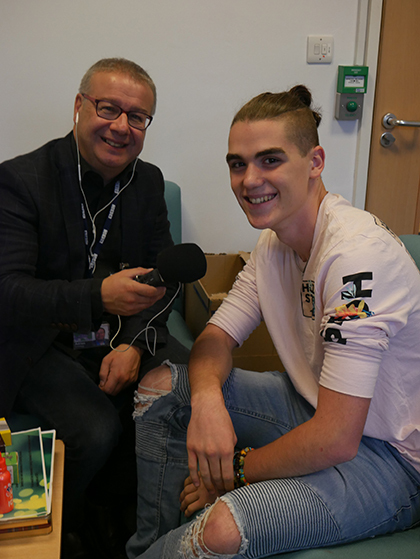 Students at The Sixth Form College, Solihull tackled the issues surrounding vaping this week when radio personality Adrian Goldberg visited the College for his 5 Live Investigates programme. The programme airs on BBC Radio 5 Live every Sunday and tackles some of the big issues of the day, investigating what is really going on in our society today. This show is looking at the rise in the number of people vaping and using e-cigarettes and in particular a trend towards different flavours and brands that might appeal to young people. Ten students at the College, including those on the Social Sciences Academy, spoke to Adrian on this topic and he was interested to hear their stories and experiences. He wanted to know if they knew of any young people who had taken up vaping and how they had taken up the habit. He showed the students some of the vaping products on the market to see what they thought of the branding of the products and who they thought these products might be aimed at. He also asked how easy it is for young people to get hold of these products, even though individuals are supposed to be 18 years old to purchase them. The findings of this investigation will be revealed when the programme airs on Sunday 7 October 2018 at 11.00am on BBC Radio 5 Live.